Now let see how long it takes the Magazine to get here. It's the 2nd of May already. Here’s the latest MAGIC Preview, offering a peek at what’s coming inMAGIC Magazine for May. If you’re not a subscriber, please give us a try. Check out our risk-free, one-month-at-a-time subscription plan at the bottom of this email. Of course, we still offer our annual subscriptions as well. If you are a subscriber, these MAGIC Previews give you an advance look at what’s en route to your mailbox. 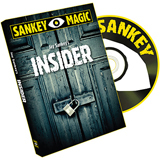 And, of course, you’ll still receive our exclusive MAGIC eUpdates with all the latest television news. Feel free to forward these monthly Previews to your friends. If you received this from a friend and would like to be added to the list, please send an email to preview@MAGICmagazine.com. Also feel free to post bits and pieces of this Preview onto magic websites. If you do, please give credit for where it came from, along with a link to www.MAGICmagazine.com. Thanks! And finally, May marks the fifth installment of this magazine available for the iPad in the App Store. If you haven't tried it, you should. The cost is $3.99 and it arrives within a few minutes. And best of all, you only buy it once, then you own it forever and can enjoy it wherever you want (Internet connection not required!). To this day, his parents can hear the impact — a metallic, horrifying thud. Their twelve-year-old son, struck by a shocked driver, flew through the air and landed twenty feet away. He lay motionless for thirty seconds, and when he came to, he went into convulsions. People look back at their lives for clues that inform future ambitions. In this case, the accident presents a perverse silver lining: if not for the head injuries, Helder Guimarães, now 28, wouldn't have decided that a career in dentistry wasn't what he wanted. If Helder hadn't been nearly killed seventeen years ago, the magic community would not have what many consider to be one of the brightest thinkers and performers of his generation. Does your script drive your show, or does your live performance help create the script? Either way, it helps to know what your audience should be aware of and when they become aware of it. The earthquake and tsunami that struck Japan on March 11 drastically affected the island nation. Looking for a way to help their countrymen, a group of Japanese magicians produced lecture notes to raise money for aid. Here, along with a sample effect from the notes, is their story. What can magicians learn from a non-magician? 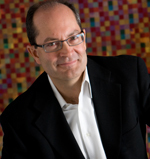 A lot, when that non-magician has a track record of reinventing venues and shows for some of the top entertainment brands in the business, raising the bar on just about every measure of commercial success in the process. Dave Goodman is such a non-magician. His act is a stylized magical courtship of an unattainable woman. It is filled with mystery, romance, music, and an inspiring, emotional finale. With this act he has been honored in competitions in many countries in South America. He has a passion for magic that is indisputable and, although he specializes in stage performance, he has been heavily influenced by two of magic's most renowned close-up artists. Oh yes — he's nineteen years old. Welcome to the world of Henry Vargas. Traditional Japanese puzzle boxes consist of sliding panels and sections that must be first discovered and then moved in a particular sequence for the box to open. They were often used to hold important documents and money. 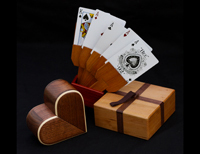 The Karakuri Creation Group is a collective of craftspeople who have taken the notion of trick boxes to an incredible level of artistry, and they produce some of the cleverest secret boxes imaginable. On Sunday, April 10, 2011, near the famous intersection of Hollywood and Vine, the Avalon Theater was lavishly decorated in the style of the famed Moulin Rouge, with musicians, singers, dancers, and artists creating a deliciously decadent atmosphere in celebration of the 43rd Annual Academy of Magical Arts Awards. This year's award show paid tribute to the AMA's 2010 Fellowship Honorees and the Magicians of the Year from the Magic Castle showrooms, as voted on by the members of the Academy. Minneapolis-based magician Suzanne made history by becoming the first woman ever to win the Close-up Magician of the Year Award at the Academy of Magical Arts awards ceremony in Hollywood, California. The Avalon Theater exploded with excitement when Keith David announced her name. Suzanne made her way to the stage and breathlessly accepted the award, thanking her family and her mentors, such as Al Schneider. We asked Shawn McMaster to see if Suzanne's pulse had calmed down enough to answer some questions about the award and what's in store for her now. Last month, Joshua Jay debuted Unreal, his new one-man show, in his hometown of Canton, Ohio, with a run of sixteen sold-out performances, April 7-16. The show is an avant-garde blend of magic, video interaction, and autobiography. He talks about the influences in his life; the artists, musicians, and filmmakers he admires. Plus, Josh does magic that deals with ex-girlfriends, his hand injury, and his travels. 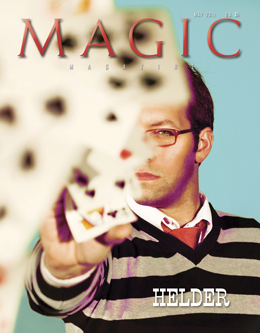 Coverage of the 2011 installment of Magic-Con in San Diego, California; the Hatch Academy of Magic & Music in Logan, Utah; and Backstage Magic with Mickey at Disney World in Orlando, Florida. We also say farewell to Dorothy Young, the last stage assistant to work with Houdini, and to Looy Simonoff, an icon on the Las Vegas magic scene. The close-up effects taught this month are Rick Lax's Free Style Wrap, Jeff Prace'sMass Times Acceleration, Curtis Kam's Psychic Exchange, and Tyler Wilson's The Big O. Plus, there's an Expertalk by Josh on Aces by Proxy. Imagine this: You are at the height of your performance, immersed in a sea of laughter. The invisible hand of the Comedy Muse leads you from one beat to the next. You are a killing machine. You indulge for a moment its sweetness; you are the bringer of joy. Your reward is the adulation of the masses. And then — there's a glitch. Consciousness narrows. Something is wrong. All that was sublime is now profane. To pay for a $4.25 drink, you pick up one of the unactivated gift cards sitting on the counter. You rub a five-dollar bill against the card and then hand it to the barista. When she protests, you insist that she run the card through her register scanner. She does. Much to her astonishment, the card registers five dollars. 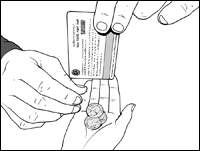 After she rings up the drink, you squeeze and slide your fingers down the card, and three quarters fall into her awaiting hand — as a tip! 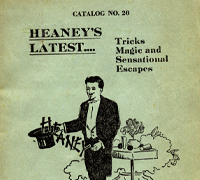 In 1920, Gerald Heaney purchased the entire stock of Will Lindhorst's magic company. Within a couple of years, he was advertising his firm as "Manufacturers — Jobbers — Importers, the Largest House of Its Kind in the Universe." 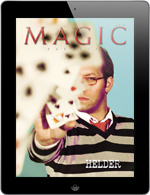 His advertising appeared in most of the magic magazines, which in turn led to his catalog being widely distributed. One such catalog arrived at 902 Olive Street Shreveport, Louisiana, home of James Airey, a.k.a. Mystic Mastoid. "Orders filled same day as received," assured the catalog, so Mr. Airey composed a sizable order on March 24, 1923, and posted the order several days later. The moment he dropped the envelope in the mailbox, the agonizing wait began. After four months of excuses, wrong tricks shipped and returned, and weeks of silence, the gloves came off. Mr. Airey sat down at his typewriter, inserted a sheet of his professional stationery, and started typing. What sets one performer apart from another? Style. But what, exactly, is style? Webster's dictionary defines style as "a distinctive manner of expression, as in writing or speech, or a particular manner or technique by which something is done, created, or performed." Style is what allows us to take the same trick, song, or script, and make it fresh and unique to our persona. This month, Joanie explores the styles of Marco Tempest, Romany, Ed Alonzo, Jeff Hobson, Kevin James, Rocco Silano, and Mike Michaels.